In urban areas during the early years of the 19th C. the spread of gas lighting was rapid, but in rural areas it was very slow in developing. 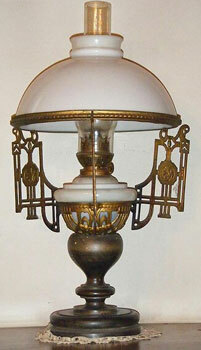 Instead, oil lights remained the most common type of lighting. The rural areas lacked the needed population density to make the production, distribution, and sale of gas cost effective. So it wasn’t until the middle to the end of the 19th C. before it was replaced by another coal-based fuel – kerosene. Unlike the coal gas used in urban areas kerosene could be stored in containers and safely delivered to customers. As the price of whale oil started to rise during the early years of the 19th C. and gas lighting was not yet available in most areas, alternatives started to be sought out. The first fuel to be developed was a mixture of alcohol and turpentine. Known as Burning Fluid it was easily produced and was inexpensive to purchase. The lamps that burned it were simple to make and operate and it produced a white, smokeless flame. But it was also one of the most volatile and dangerous lighting fuels ever produced. Hundreds of people were injured or killed in accidental fires. Therefore, a search for a better replacement was widely pursued. In 1846, a Nova Scotia physician named Abraham Gesner was experimenting with coal as a fuel source. Related to but different from illuminating gas, he produced a clear, thin fluid which he named kerosene. It was inexpensive to produce and much safer than the earlier burning fluids. It very quickly replaced oils as the main source of illuminate throughout the rural areas in America. 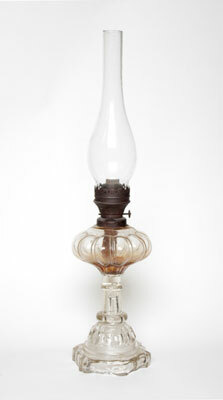 By 1864 it unquestionably became the most popular lamp fuel in North America. 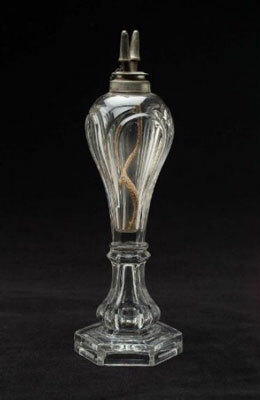 A flat-wick lamp was the most common type of kerosene lamp. Simply constructed it consisted of a fuel tank with an attached lamp burner and a glass chimney. The chimney performed two important functions. The first is that it kept the flame from burning out, and second, its shape created a thermally induced draft which enhanced combustion. The bottom of the flat cotton wick extended into the kerosene and the top was held in place by a wick-adjustment mechanism. The quality of the flame was controlled by adjusting the height of the wick. The last and most significant advancement in lamp design was when the Welsbach mantle technology that was commonly used with coal gas lighting was applied to kerosene lighting (refer to the Gas Lighting section). This technology proved so successful that it has remained essentially unchanged and continues to be used in modern camping lanterns. Kerosene lamps continued to be used in many parts of the U.S. well into the 20th C. until the rural areas were fully electrified and incandescent lighting was introduced. The visual effects of kerosene lighting remained similar to that of animal and plant oil lighting except it was much brighter – approximately twice as many lumens per Btu.